John Bergman, KC5LK, of Brandon, Mississippi, has been named the new CQ Worked all Zones Award Manager, effective January 1, 2015, it was announced today by CQ magazine Editor Rich Moseson, W2VU. Bergman will succeed fellow Mississippian Floyd Gerald, N5FG, who has served the DXing community in the position for the past 11 years. John has been licensed since 1978 (originally as KA5AFT), and holds an Advanced Class license. He has been heavily involved in DX and DXing for over 20 years, is a charter member of the 599 DX Association, former member of the Magnolia DX Association, and a member and past president of the Jackson Amateur Radio Club. He is also a volunteer examiner and a card checker for both ARRL and CQ awards. John also dedicated 10 years to working with the W5 incoming QSL Bureau. He holds DXCC (338 current entities; 344 total); 5-Band DXCC with endorsements for 30, 17 and 12 meters; has 1680 band/entities in the DXCC Challenge, is a member of the DXCC Mixed and Phone Honor Rolls, and has 5-Band WAZ with 179 total zones to date. "We wish Floyd well in his retirement from WAZ and thank him for his decade-plus of dedication to the DXing community," noted CQ Editor Rich Moseson, W2VU. "I am looking forward to working with John as he assumes the leadership of the most prestigious award program in all of amateur radio. WAZ is the second-oldest active award program in ham radio, and one of the most difficult to achieve. I am confident that John will do an excellent job of preserving its heritage while also promoting its future growth." "I am very appreciative of Rich and CQ magazine giving me this opportunity to serve CQ and the DX community," said Bergman, "and will strive to continue the high standards of WAZ Awards program." As of January 1, any correspondence relating to the CQ WAZ Award program should be directed to: John Bergman, KC5LK, P.O. Box 792, Brandon, MS 39043, USA; or via e-mail to <kc5lk@cq-amateur-radio.com>. Two satellites carrying ham radio payloads were among more than two dozen satellites lost in the October 28 launch failure of Orbital Sciences Corporation's Antares 130 rocket. The rocket malfunctioned seconds after launch from NASA's Wallops Island spaceport in Virginia and was destroyed by the range safety officer in a spectacular explosion. According to the ARRL Letter, the satellites aboard the craft included two with amateur radio payloads -- the Radiometer Atmospheric Cubesat Experiment (RACE) built jointly by the University of Texas at Austin and NASA's Jet Propulsion Laboratory, and GOMX-2, designed by Aalborg University in Denmark. GOMX-2 was to test a new de-orbiting system and flight-qualify a new high-speed UHF transceiver and a software-defined receiver built by Aalborg. It had a data downlink on 70 centimeters. RACE carried a new 183-GHz radiometer designed by JPL and had ham-band data and CW telemetry downlinks on 70 centimeters. UT Engineering Professor Glen Lightsey, KE5DDG, told the Letter, "It's unfortunate, but it is also part of the aerospace industry." 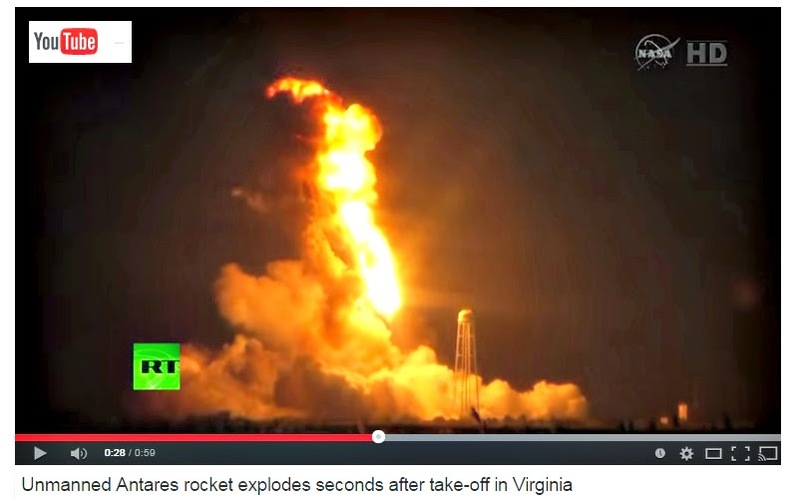 Watch video of the Antares explosion at < http://bit.ly/AntaresExplosion >. The U.S. 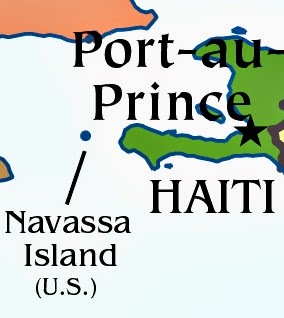 Fish and Wildlife Service has granted permission to the KP1-5 Project to mount a DXpedition to Navassa Island in the Caribbean in January 2015. Navassa is No. 2 on DX magazine's "most wanted" list. The call sign will be K1N. Specific dates had not been set as of press time. For more details, see December CQ's DX column on page 86. 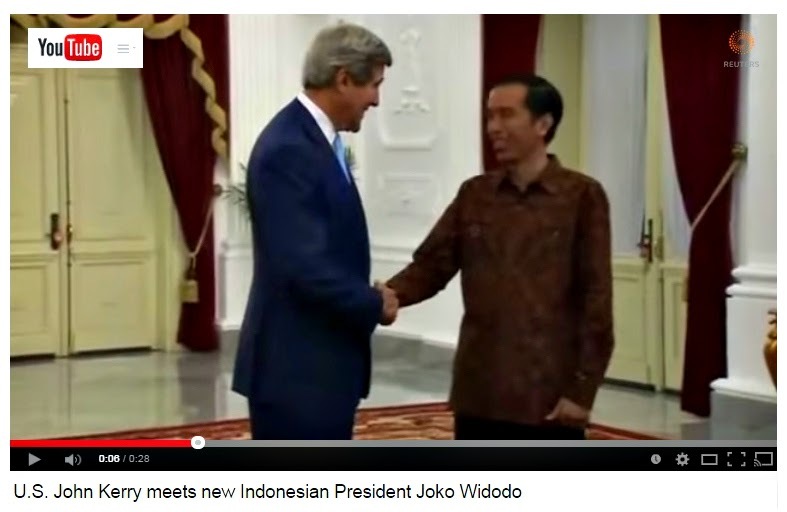 The new president and vice president of Indonesia are both hams, according to the ARRL, which reports that President Joko "Jokowi" Widodo is YD2JKW, while Vice President Jusuk Kalla is YC8HYK. Both were inaugurated on October 20, with U.S. Secretary of State John Kerry in attendance. Indonesia is the world's third-largest democracy. Indonesian hams may be called on to help respond to any possible Ebola outbreak in the country. According to Newsline, an article in the Jakarta Post reported that amateur radio was an element of a proposed standard operating procedure being developed in the event that any cases of the deadly disease reach Indonesia. Houlin Zaho will take his new post on New Year's Day. 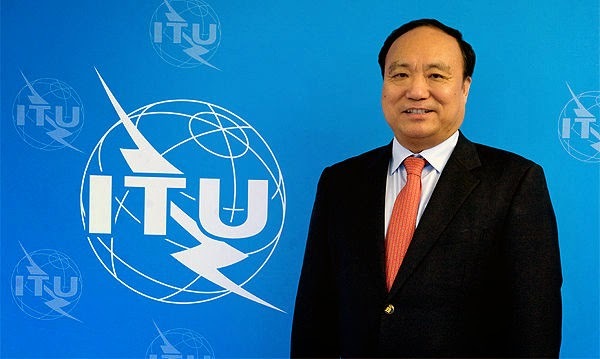 Houlin Zhao of China has been elected the new Secretary-General of the International Telecommunication Union (ITU), succeeding Dr. Hamadoun Touré, who is also HB9EHT. Zhao has served as Touré's deputy for the past eight years. He takes over the top spot on January 1, 2015, according to the ARRL Letter. A satellite from Luxembourg, flying as a "passenger" on a Chinese lunar fly-by mission and transmitting on 2 meters, successfully flew to and around the moon, then returned to Earth orbit. The Chinese mothership deployed the 4M (Manfred Memorial Moon Mission) satellite into orbit before it safely landed back on Earth. Several amateurs were able to track 4M on its journey. For more info, click here or visit < http://moon.luxspace.lu/blog/ >. W8PAL paper license, circa 1935. The ARRL has asked the FCC to continue routinely sending paper licenses to new amateurs, even as it begins to phase them out overall. The FCC has indicated that it plans to stop routinely issuing printed license documents to Wireless Service licensees (including hams), unless they are specifically requested. For the FCC's purposes, your listing on the Universal Licensing System (ULS) database is your official license document. 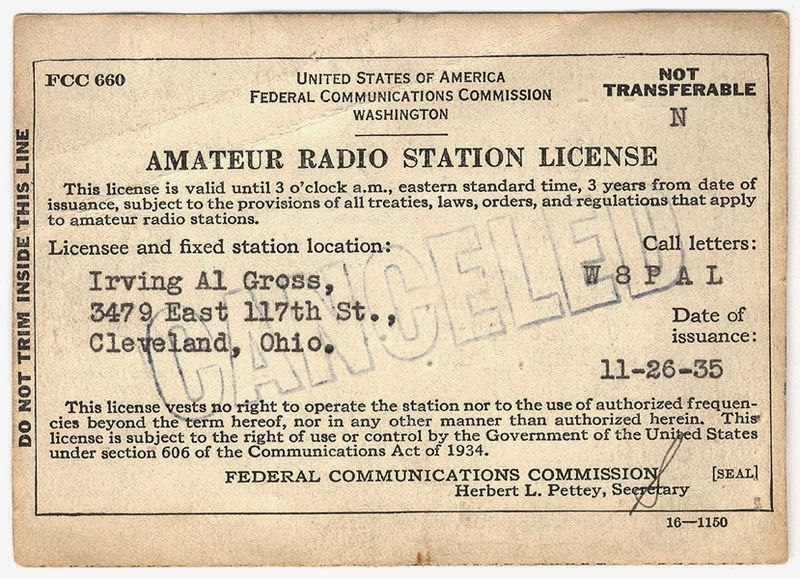 According to the ARRL Letter, the League pointed out in its comments that requiring individuals to go online to either download or request a printed license may be a roadblock to some applicants, and pointed out that official license documents are still required for such things as taking upgrade exams or applying for call sign license plates. The ARRL proposed sending a printed license to newly-licensed hams, along with instructions on selecting a preferred method for future renewals and upgrades. Responding to a federal law that requires states to ban texting while driving in order to receive federal funds for driver safety programs, the ARRL Executive Committee has updated the League's policy statement on mobile operating to urge continued exemption of amateur radio communications from many of these restrictions. The League called for states and municipalities to narrowly define "wireless communications devices" to include only "full duplex wireless telephones" and to specifically exclude "two-way radio communications equipment." The complete text of the policy statement is available at < http://www.arrl.org/mobile-amateur-radio-policy >. The ARRL Board of Directors will be taking up a proposal at its January meeting from Southeastern Division Director Doug Rehman, K4AC, who wants the League to petition the FCC for expanded HF digital privileges for Technician Class hams. Rehman wants to see these privileges extended to 80, 40 and 15 meters as well as the current allocation on 10 meters. The League's Executive Committee debated the proposal at its October meeting and recommended that the full board in January consider soliciting input from members on adding digital privileges for Technicians only in the current 15-meter Novice/Tech subband. According to the ARRL Letter, ARRL CEO Dave Sumner, K1ZZ, emphasized that this is still very preliminary. "This is not a proposal that the Board adopt data privileges for Techs and Novices on 15 meters as an objective, and it is most definitely not an ARRL proposal to the FCC," Sumner stressed, adding "(t)hat would come later, if at all, after the Board has had an opportunity to weigh membership input." The Radio Society of Great Britain's Islands on the Air (IOTA) program managers have decided to "freeze" any IOTA actions related to Crimea for at least a year, because of the still unresolved political situation there. Crimea was annexed by Russia after a referendum there called for separation from Ukraine, but the action has not been recognized by the international community. The Amateur Radio on the International Space Station (ARISS) program is accepting applications from schools and other "formal and informal educational institutions and organizations" for amateur radio contacts with the crew of the ISS next year. But the application window closes on December 15. These applications would be for space station contacts between May 1 and December 31, 2015. For details, click here or visit < http://bit.ly/1xqT6CZ >. KK6ISM , wearing assistive hat. California high school student Shiloh Curtis, KK6ISM, has been named one of nine Popular Mechanics "Future Breakthrough Award" winners for designing a robotic navigation aid system for people with visual impairments. 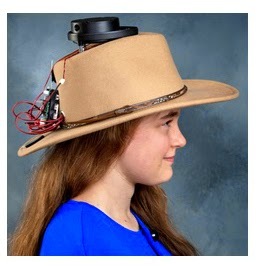 According to the ARRL Letter, Curtis's device is built around a hat containing a robot vacuum cleaner's laser distance sensors and vibrating motors to warn wearers of obstacles. A high school junior, Shiloh and her project have also been recognized as the California State Fair's "Project of the Year" and as a regional finalist in the Google Science Fair. Her father, Dave Curtis, is also a ham, N6NZ. Lisa Leenders, PA2LS, IARU Region 1 Youth Working Group chair. 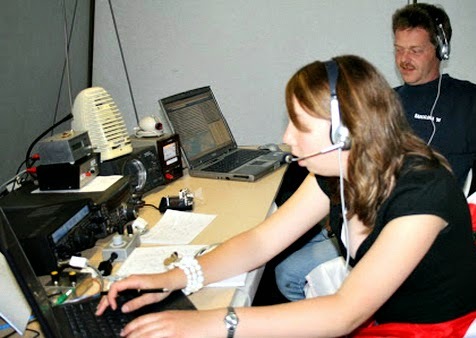 Region 1 of the International Amateur Radio Union (IARU R1) - representing national ham radio societies in Europe, Africa and the Middle East - has formed a region-wide Youth Working Group and appointed 24-year-old Lisa Leenders, PA2LS, of the Netherlands, to a three-year term as Chair and Youth Coordinator. According to the ARRL Letter, the group was also given a three-year budget of nearly $30,000 US for events and activities. One of its first projects will be to organize and coordinate Youngsters On The Air (YOTA) events and activities. Delegates to the IARU Region 1 general conference in Bulgaria in September also approved forming an Amateur Radio Observation Service to monitor DXpeditions for malicious interference and to try to track down possible sources. The delegates also supported a proposal by five IARU R1 countries to the European Conference of Postal and Telecommunications Administrations (CEPT) for a region-wide secondary amateur allocation at 69.9-70.5 MHz, also known as 4 meters. Some European countries already allow amateur operation on 4 meters. A request to the FCC for a matching band in the US was recently turned down. The Administrative Council of the International Amateur Radio Union (IARU) is asking member nations of the International Telecommunication Union (ITU), to take steps to minimize interference to amateur radio by "electrical apparatus or installations of any kind, including power and telecommunication distribution networks." 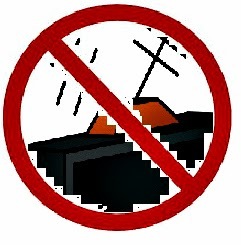 The ARRL Letter reports that the council adopted a resolution that highlights "rapid and largely uncontrolled growth" of devices - such as plasma TVs, switching power supplies and Broadband over Power Lines (BPL) - that generate RF energy "as an unnecessary and undesirable consequence of their operation." The resolution calls on regulators to set strict standards for interference reduction and on manufacturers to voluntarily "minimize radio spectrum pollution emanating from their products." We are saddened to report the passing of several prominent amateurs in October. The ARRL Letter reports that Ken Holladay, K6HCP, the co-founder of both Mirage Communications and KLM antennas, became a Silent Key on October 14 after an extended illness. He was 75. Sheldon "Shelly" Weil, K2BS, passed away on October 29 from complications due to injuries suffered in a fall. He was 81. Weil was a leader in scouting and amateur radio over several decades, staffing ham stations at national and world jamborees. He also served as chairman of the Boy Scouts of America's National Jewish Committee on Scouting. Author Bill Sabin, WØIYH, of Cedar Rapids, Iowa, became a Silent Key on October 13 at age 88. A longtime engineer for Collins Radio Company, Sabin authored more than 40 technical articles and contributed to or co-edited three books on single sideband and HF radio. He was the author of Discrete Signal Analysis and Design, and a contributor to ARRL's RF Amplifier Classics. Newsline reports on a new "app" for Apple devices running the iOS 8 operating system called "Morse Code Telegraph Keyboard." It replaces the on-screen keyboard of your iPad or iPhone with a J-38-looking hand key on which you can tap out letters in Morse code and have them print out in your e-mails or iMessages. Considering how difficult some people find using the on-screen keyboard, this just might help you compose messages with fewer typing errors! It's $1.99 at the Apple App Store.